Another visit to the IT Monster Predator Lake in Thailand saw Boy accompanied by Brendan in search of Amazonian giants. In a highly productive day Brendan caught numerous predatory species including Redtail catfish, Sorubim, Asian Redtail?s and a whole host of other species. With darkness setting in a large Arapaima was observed to be surfacing regularly in a quiet corner of the lake. After quickly dispatching a mackerel deadbait into the general direction of the monster fish the anglers sat back and waited. Minutes later the deadbait was picked up by an extremely large and agitated Arapaima which proceeded to charge off towards the centre of the lake! A dogged thirty minute battle commenced which saw the mighty Amazonian predator throw itself from the water on several occasions in an attempt to free itself of the hook! Finally the giant predator was brought to the margins where it was expertly netted by Boy. 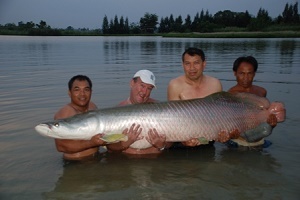 The large Arapaima was estimated to weigh 110kg+ and had a length of well over 2 metres with an extremely large girth. This fish was a personal best for this species for Brendan.